In every endeavour, AKDN collaborates closely with the communities involved to identify the needs which they consider most important to improving their livelihoods. 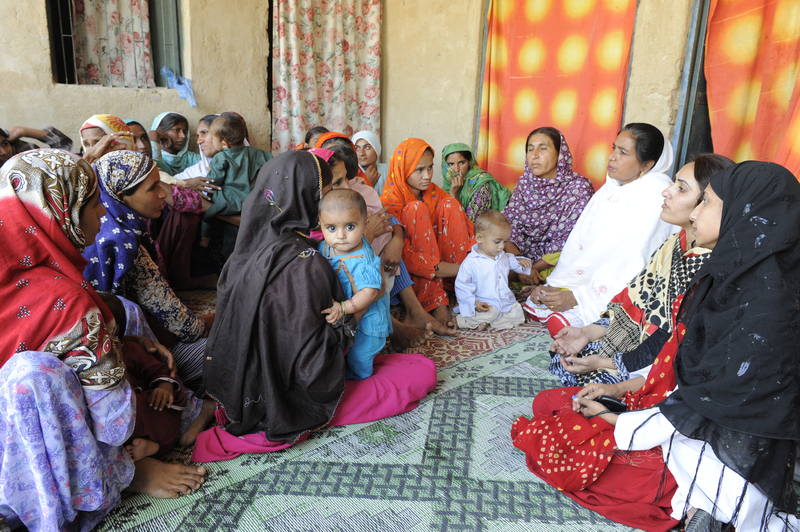 Many of the methods developed for creating and maintaining a strong civil society were pioneered in Pakistan, not least the village organizations first created under the Aga Khan Rural Support Programme (AKRSP). More recently, AKDN’s Civil Society programme has been working to help civil society organisations - broadly defined - to become more efficient and effective. Village Organisation (VO) meeting in Rahimabad, Pakistan. In every endeavour, AKDN collaborates closely with the communities involved to identify the needs which they consider most important to improving their livelihoods. Building a sound baseline of information on the civil society sector: Baselines make it possible to measure impact and the progress of a programme over time. Enhancing the competency and sustainability of Civil Society Organisations (CSOs): This component encompasses initiatives to build the organisational capacity of indigenous CSOs, with a special focus on good practices in such areas as forming partnerships, constituency building, participation, joint planning with stakeholders, mediation, encouraging pluralism, and peace building. Fostering ethics and integrity amongst development agencies: As efforts in poverty reduction, civil society strengthening, and development in general are frequently thwarted by the widespread prevalence of corruption among entrenched bureaucracies, with private commerce and leadership structures uncontrolled by mutually agreed social contracts, modules will be developed to show ways to pre-empt the risks of corruption, identify problems when they occur, and introduce corrective measures. Fostering strong and effective collaboration between governments and CSOs: While public-private partnerships show great promise for increasing the impact of development initiatives, an impediment to such improvement is the generally unfavourably view governments have of CSOs (especially NGOs), based on a range of perceptions including about the legitimacy of their right to exist, their probity, governance, and patriotism, and excessive personal benefits. Many government officials are unaware of what CSOs do or the valuable contributions they make (or could make) to the development agenda. Various activities are planned to both address these prejudices and create an enabling environment for collaboration. Fostering strong and effective collaboration between the business sector and CSOs: While many commercial sector professionals in developing countries are interested in actions of social responsibility, they are not clear about what they can do. AKDN, which runs project companies as businesses as well as CSOs, can identify compatibilities and act the “marriage broker” role between these often polarised sectors. The Pakistan Centre for Philanthropy (PCP), which was launched from research conducted by AKF in 2000, and following the Conference on Indigenous Philanthropy, (held in Islamabad on 21 October 2000) was created to focus on indigenous philanthropy. The research showed that indigenous philanthropic activity generated up to five times the amount of money as foreign aid. But many government officials and ordinary Pakistanis looked at CSOs and wondered if they were effective. To address these concerns, the Aga Khan Foundation (AKF) set up an NGO Certification Programme within the PCP that brought together distinguished and experienced people drawn from civil society, business and the Government. A rigorous review process leads to certification if a CSO maintains required levels in three areas: Internal Governance, Financial Management and Programme Delivery. In 2005, the World Bank pointed to the PCP as a model: “The Pakistan Centre for Philanthropy’s non-profit organisations certification programme is the first of its kind in the South Asia Region, although it is based on similar initiatives elsewhere, particularly one in the Philippines. The objective is to help non-profit organisations diversify their resource base and expand their programmes while at the same time demonstrating their commitment to best practices in governance and management." Certification is a “seal of good housekeeping” for organisations that meet defined standards of organisational effectiveness based on an independent evaluation of their governance, financial management and programme delivery. PCP staff spend two to three weeks reviewing an NGO’s documents and examining its operations before deciding whether or not to recommend the NGO to the certification panel that is made up of a majority of private sector representatives along with two government officials. The process is voluntary and does not come under the control of any government ministry, and organisations that do not qualify the first time, but would like to try again are offered help to create and implement an improvement plan.